Upon rediscovering his original photos in 2009, Chris sent some shots to the Peterborough Telegraph which published them over several weeks asking the public to get in touch if they recognised anyone in the images. 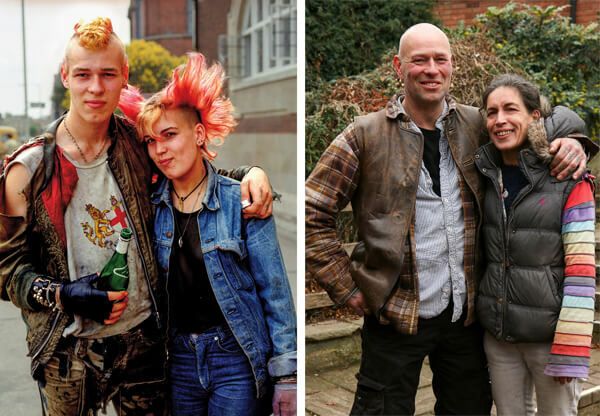 Following a great response, the photographer then spent several years using social media and other means to track down the subjects, and managed to painstakingly recreate 128 different photos that he’d taken years before. Many of the original images perfectly captured the era with various shots of the punk movement as well as the relatively new increase in diversity around the city. Of course the world is very different place from the time those photographs were taken, and the recent shots show not just how the subjects themselves have changed, but the city around them too. The result is a wonderful comparison between two eras and the lives that inhabited them. You can buy the full collection in Chris Porsz’ book ‘Reunions’, available from his website, as well as locally in several Peterborough book shops.